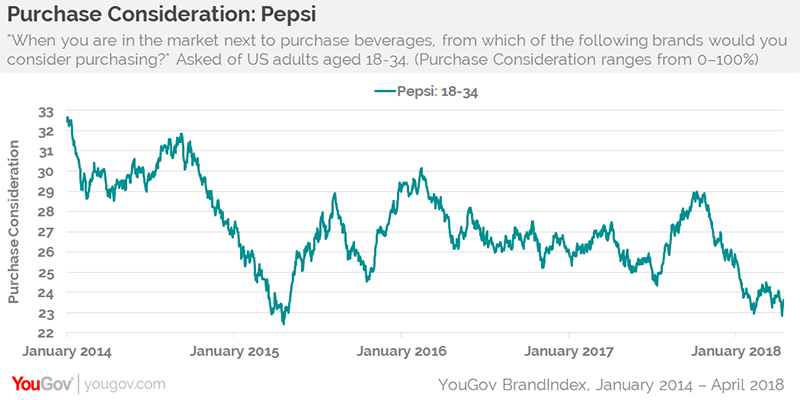 One year after pulling its controversial Kendall Jenner ad, Pepsi’s brand perception with millennials has made an infrequently seen recovery, but it is not out of the woods – the age group’s consideration of purchasing a Pepsi is at its lowest level in three years, according to YouGov BrandIndex. It took nine months for Pepsi’s perception to fully recover with millennials from the ad’s backlash, which stemmed from making light of the Black Lives Matter movement. Pepsi’s perception level was stuck in a “trough” from May through July last year, the lowest it had been in at least eight years. It then rose back to where it was pre-crisis, something that happens very infrequently after a calamity. However, that recovery did nothing to halt a long-time Purchase Consideration slide with millennials, a key metric of potential sales revenue. Since 2014, that metric fell from 33% of millennials considering buying a Pepsi the next time they purchased a beverage to its current 23%. The Jenner ad brought Pepsi’s Purchase Consideration score with millennials down from 27% to 24% from early April to mid-July. That level turned around to reach 29% in November, perhaps impacted by the brand’s ubiquity during football season or the summer 2017 introduction of Pepsi Fire, a limited edition cinnamon-flavored spicy soda. After November, Purchase Consideration trailed back down to 23%, the lowest it’s been since April 2015. According to data from YouGov Profiles, 37% of US adults aged 18-34 enjoy watching ads starring their favorite celebrities, compared to 30% of the general public. Additional numbers show that 68% of millennials like when companies have a moral message. The same is true for 67% of all American adults. Pepsi’s consumer perception was measured with YouGov BrandIndex’s Buzz score, which asks respondents: "If you've heard anything about the brand in the last two weeks, through advertising, news, or word of mouth, was it positive or negative?"